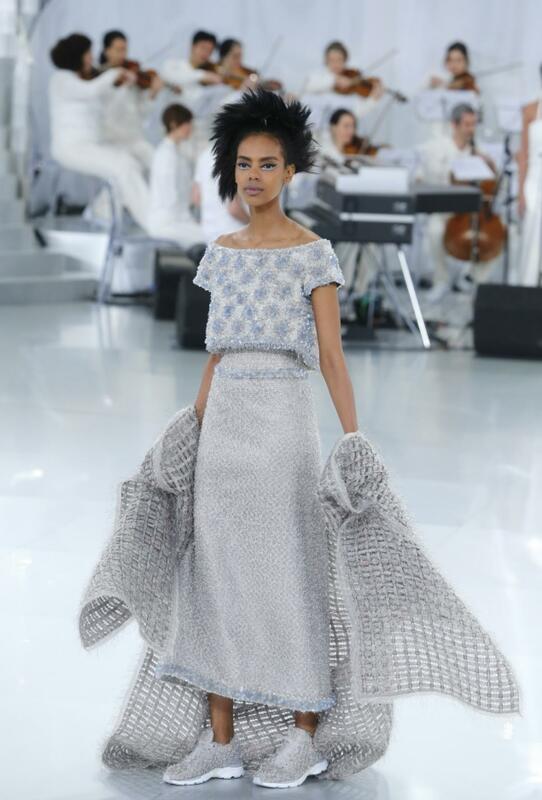 It was a message echoed at Giambattista Valli, Vionnet and Chanel, where the models had a spring in their step. They skipped, sauntered and bounded down the double staircase that was part of Karl Lagerfeld’s jazz club set within the Grand Palais. The collection’s recurring silhouette consisted of a corset topped by a cropped shirt or bolero. Coco Chanel herself rejected garments that constricted the body, but today, emphasizing the midriff – even by wrapping it in the finest Chanel tweed – fits our fixation with fitness. To underscore the athletic message, many of the looks were accessorized with knee pads, fanny packs and sneakers in lace and python that are expected to cost upwards of €3,000. This entry was posted in Uncategorized and tagged accessorizes, athletics, athletics and fashion, body, bounding, Chanel, Coco Chanel, current fashion, fanny packs, fashion, fashion collections, feet deliver the message, fitness, fitness fascination, fixations, Giambattista Valli, Grand Palais, grande dame of fashion, Haute Couture sneakers, Karl Lagerfeld, Karl Lagerfeld’s jazz club, knee pads, models, Paris last week, running, sauntering, shoes, skipping, sneakers, spring 2014 haute couture runways, spring in their step, step, tattoos, Vionnet. Bookmark the permalink.